To quote Oakland Raiders’ Jon Gruden, “Good pass rushers are hard to find.” For that reason, a lot of NFL teams, including Gruden’s Raiders, will be looking to add talented pass rushers to their rosters in the offseason. Here’s a list of a handful of pass-rushers entering the 2019 NFL Draft and free agency this offseason that should serve as immediate upgrades. Projected as the No. 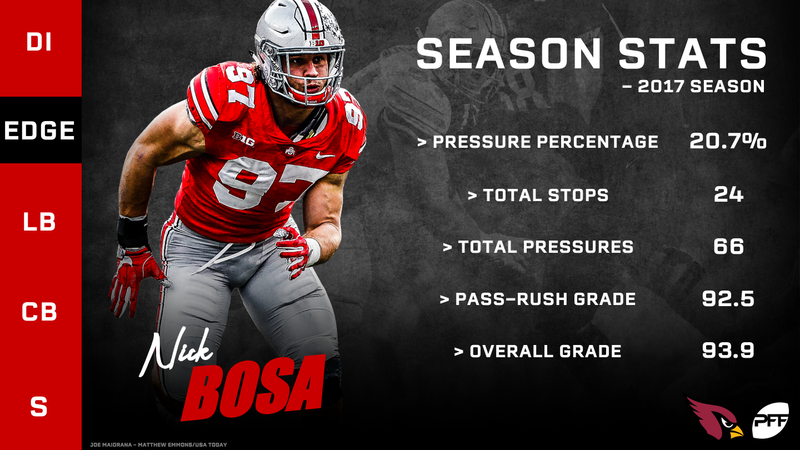 1 overall pick in PFF Senior Analyst Mike Renner’s latest mock draft, former Ohio State edge defender Nick Bosa is hands down the best pass-rushing talent in the 2019 draft class. Going back to his 2017 season, Bosa earned an impressive 92.5 pass-rush grade and a 20.7 pressure percentage along with his 24 defensive stops. The Dallas Cowboys asked edge defender Demarcus Lawrence to prove he was more than a one-year wonder after his epic 2017 season, opting for the franchise tag rather than a multi-year deal last offseason. And, well, he proved it. Lawrence finished the regular season ranked ninth at his position in pass-rush grade (84.5) and 15th in pass-rush win percentage (16.6%), recording 63 total pressures in the process. Alabama’s Quinnen Williams tied for first in pass-rush grade (92.5) and pass-rush win percentage (20.6) this past season, exploding onto NFL radars seemingly overnight largely because of said pass-rush ability. His 60 total pressures (31 hurries, 17 hits, 12 sacks) led all interior defensive linemen in the country, as well. Super Bowl champion edge defender Trey Flowers, whether it’s offered to him from the New England Patriots or another NFL franchise, will sign quite the lucrative contract this offseason – and for good reason. Flowers ranked 11th in pass-rush grade (80.6) and tied for fourth in pass-rush win percentage (18.5) during the 2018 regular season. Josh Allen’s 94.3 pass-rush grade this past season ranked first among all FBS edge defenders with at least 200 pass-rush snaps on the year, and he also ranked second among the group in pass-rush win percentage (29.1). At this moment, we expect him to go just after Bosa in the 2019 NFL Draft. 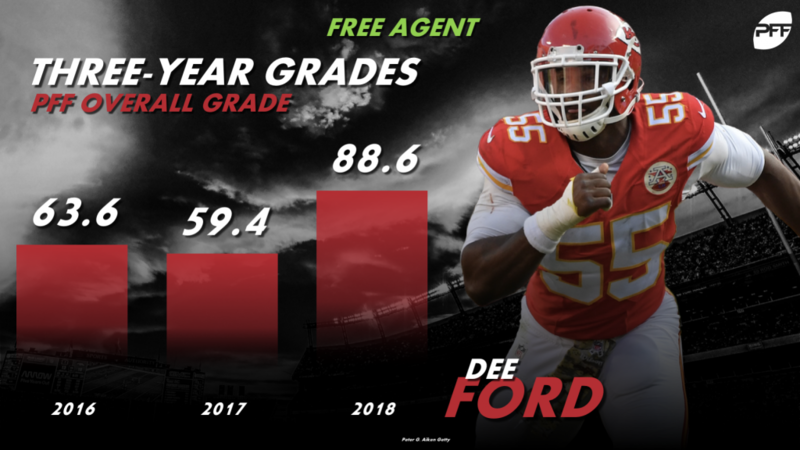 Kansas City Chiefs’ Dee Ford turned in a career year in 2018, earning the league’s best pass-rush grade (91.0) and total pressure count (86) among qualifying edge defenders. He also ranked 14th in pass-rush win percentage (16.8) among the same group of qualifiers. Though he doesn’t get the same love as Bosa and Allen do at the top of the draft, Florida State’s Brian Burns is loaded with pass-rushing talent. His 90.4 pass-rush grade tied for eighth at his position this past season, and he ranked third in the country in total pressures with 66. Earning an 86.7 pass-rush grade and a 16.2 pass-rush win percentage this past season, Grady Jarrett is the best pass-rushing interior defensive linemen set to test free agency in 2019. If the Atlanta Falcons don’t tie him down with an expensive, multi-year deal, another team will jump at the opportunity. The love for Florida’s Jachai Polite is growing for all the right reasons. The 20-year-old edge prospect has an array of pass-rush moves and should continue to develop at the next level, all adding to his high-end pass-rush potential. Frank Clark had an outstanding contract year with the Seattle Seahawks in 2018, finishing the regular season ranked 11th in pass-rush win percentage (17.4) and 19th in pass-rush grade (75.2). At just 25 years old, Clark is still getting better as a pass-rusher and could very well develop into one of the league’s best in the next few years.